Having recently watched Snow White and the Seven Dwarfs on DVD, I was also given the change to view the Blu-ray version and like the aforementioned format, the Blu-ray version has received a rather impressive facelift that has had the video and audio cleaned up considerably. Best of all, this 1937 feature film comes alive again in 2009 and once again, we were captivated by this enchanting movie about a princess and her seven new found friends. Like the DVD version, the animation for a movie from 1937 is thoroughly impressive that boasts exceptional picture quality and it almost looks like a painting come to life. The only drawback to the movie like the DVD version is unfortunately the audio quality, however thankfully once you get immersed into the movie, it becomes a thing of the past. I understand that the cartoon was made in 1937, however Disney should be commended in transferring this to Blu-ray and t 72 years of age, you'll be pushing it to look this good! Of course, the songs in the movie are truly memorable classics like "Heigh Ho, Heigh Ho, we're off to work we go!" and is probably an element of the film which made it so popular among all viewers. Featuring a variety of genres in this classic tale from comedy to romance and adventure, Snow White and the Seven Dwarfs is a must have collection for almost everyone. Whether you have children or wish to walk down memory lane, this movie can be watched time and time again. 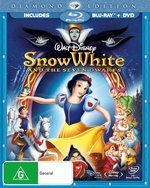 Of course to celebrate the Diamond anniversary of Snow White, Disney have released this movie as a 2-disc edition that features some memorable special features that include commentary, the songs of Snow White and some great deleted scenes and explanations behind the creation of this magical movie. Lastly, add in some great games and activities and you have a must have Blu-ray for Christmas.